Omo I and II (195,000 years ago): In 1967, a team led by Richard Leakey discovered possibleHomo sapiens fossils in the Kibish Formation near the Omo River in southern Ethiopia. Originally the fossils, Omo I (a partial skull and skeleton) and Omo II (a partial skull), were thought to be 130,000 years old, but a dating reanalysis in 2005 revealed they were much older—195,000 years old, making them the oldest fossils assigned to Homo sapiens. Over the last 45 years, the species status of the fossils has been debated. Researchers largely agree Omo I was a modern human; it had the human hallmarks of a flat face, fully formed chin, high forehead and globular braincase. They are less certain about Omo II, which was more primitive with its thicker, more “rugged” cranial bones and sloped forehead. While some paleoanthropologists say Omo II is too archaic to be one of us, others suggest it’s evidence of the great physical diversity of early modern humans. 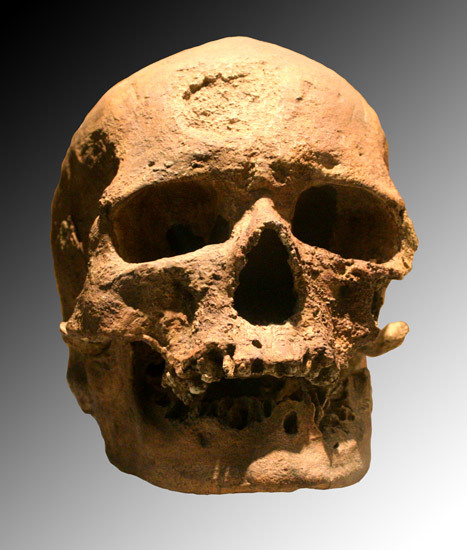 Herto fossils (160,000 years ago): Tim White of the University of California at Berkeley and colleagues unearthed three largely complete skulls, two adults and one child, in the Middle Awash region of Ethiopia in 1997. The skulls appear quite modern, the researchers reported in Nature in 2003. But because certain cranial traits are outside the range of modern human variation, the researchers placed the Herto fossils in their own subspecies, Homo sapiens idaltu (idaltu means “elder” in the Afar language of Ethiopia). Cutting and scraping marks on the skulls suggest these early humans engaged in some sort of mortuary practices, as these types of markings are not typical of cannibalism. Qafzeh and Skhul fossils (~100,000 years ago): In the 1930s, researchers working in the caves of Qafzeh and Skhul in northern Israel found the skeletal remains of at least 30 individuals, a few purposefully buried. Some researchers suggest the fossils represent an early migration of humans out of Africa. But like Omo II, some of the fossils in the collection are difficult to classify. For example, the skull known as Skhul V had thick brow ridges and lacked a chin. The primitive traits in this population might have been the result of interbreeding with Neanderthals, which also lived in the region at this time. Cro-Magnon 1 (30,000 years ago): OK, this fossil is too young to be a real contender for the oldest member of our species. But I included it on the list for its historical significance. Discovered in France in 1868, the Cro-Magnon 1 skull was one of the first ancient Homo sapiens fossils ever found, demonstrating our species’ great antiquity.